In this business of horses, time is always at a premium. The need for a solution for the time-sucking nonsense and nuisance of watering our own indoor arena led me to MAG Flakes five years ago. A recommendation from friends using MAG sold me to try the product. After having it in our arena for a month, I was certain I’d made a wise investment. Instead of wasting time and water every three days to control dust, now I use my free time to ride my horse or just put my feet up for twenty minutes and relax! Call me at (716) 434-5371 for more information and to discuss your arena footing specifically. Or email me by using the contact form below or directly at: [email protected]. After the proper amount of MAG Flakes for your arena is determined, I can provide you with a quote for MAG Flakes delivered. 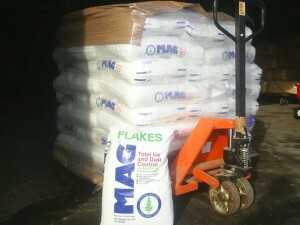 MAG is shipped in fifty pound poly bags on pallets. Each pallet contains 48 bags; weighing 2400 lbs and measures 44″ wide by 44″ deep by 46″ tall. Our shipments are delivered by LTL common carrier freight companies or you can arrange to pick up your MAG yourself at our warehouse in Lockport, NY. We use freight companies like Central Transport, Land Air Express, A. Duie Pyle, Estes-Express and others to get your MAG Flakes delivered to you at the lowest rates! LTL common carrier drivers will move the pallet to the end of the trailer and you can unload with a tractor with pallet forks or simply unload the 50 lbs. bags by hand onto your truck or trailer. Lift gate service is available in certain areas. Payment can be made easily by credit card over the phone or via e-mail with PayPal or by check. Fill out the contact form below for an estimate on how much MAG you’ll need.